Henry Herbert Tailors are based at 8 Lamb’s Conduit Passage, London, WC1R 4RG. The closest tube is Holborn. It is easy to get it confused with Lamb’s Conduit Street … we are on Lamb’s Conduit Passage! Hopefully the below information will help you find us quickly and easily. However, if you have any problems at all just call us on 020 7837 1452 and a Henry Herbert tailor will be more than happy to direct you or come out and find you. To email Henry Herbert, just click here. The closest tube to Henry Herbert Tailors is Holborn Underground station. We are a short five minute walk from Holborn. As you reach the top of the escalators, take your first right to exit the Underground station. Head towards Red Lion Square and Lamb’s Conduit Passage runs directly off the square. For help navigating on the London underground system, click here to open up the tube network map. If you are cycling to Henry Herbert Tailors, then the least we can do is let you bring your bicycle into our workshops where we can keep a safe eye on it for you. Our tailors are all keen motorcycle and scooter riders and we know that finding a space can be difficult sometimes. We are based in the Borough of Camden and motorcycle parking in designated motorcycle bays is kindly provided free of charge. The closest motorcycle bays to Henry Herbert are located in Red Lion Square (postcode: WC1R 4HQ). There are four bays in the Square and from there we are a short one-minute walk away. Red Lion Square leads directly on to Lamb’s Conduit Passage. The closest bus stop is either Red Lion Street bus stop or Red Lion Square bus stop. If arriving at Red Lion Street bus stop, the following buses stop there: 19, 38, 55 and the 243. If arriving at Red Lion Square bus stop the following bus stops there: 19. If travelling, by car please remember to pay the congestion charge. More details about the changes and times can be found on the Congestion Charging website. There is designated on-street paid-for parking in both Red Lion Square (postcode: WC1R 4HQ) and Red Lion Street (postcode: WC1R 4PF). Please ensure you do not accidentally park in a Residents Bay! London is served by a wide variety of international and national airports. Henry Herbert is easily accessible by Heathrow, London Gatwick, City airport and London Stansted. Luton Airport also has a direct train service from the airport to Farringdon station and we are a short 15 minutes walk from Farringdon underground and train station. As a bespoke tailoring firm, we have to work on a strict appointment basis to make sure we have enough time with each customer individually. Please make your appointment online here or call ahead on telephone 020 78371452. We are afraid we will not be able to see you without an appointment. We look forward to being of service to you. Henry Herbert at 8 Lamb’s Conduit Passage offers full ground floor accessibility to customers with a disability. There is a small step to access our premises, but we have a ramp which can be deployed to make access more comfortable. We have a wide open ground floor shop space to make accessibility and a visit as comfortable as possible. If you wish to view our premises before your arrival, simply take a look here. 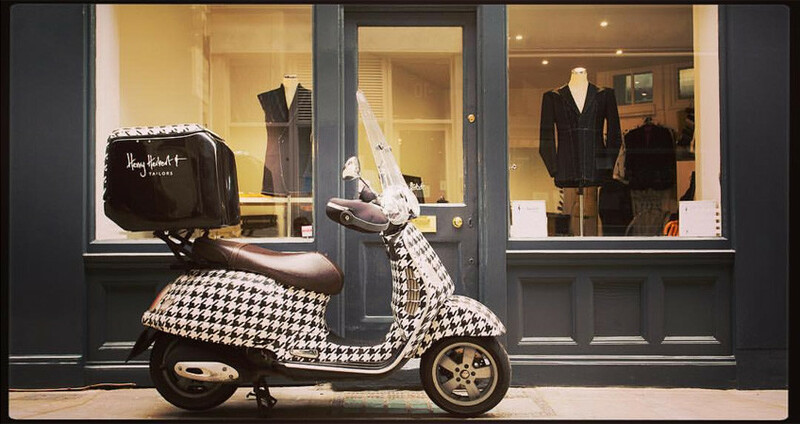 Alternatively if reaching us is difficult, you may wish to use our complimentary Savile Row by Scooter service, whereby we meet you any place at anytime at no charge at all within the London area. Finding Henry Herbert Tailors - Bespoke Suits By Savile Row Tailors.